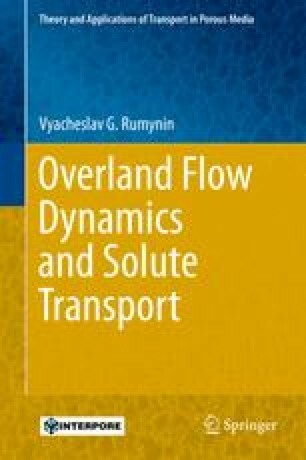 In this and the following three chapters, we will focus explicitly on the dynamic (transient, short-time-scale) hydrological processes that determine the partitioning of rainfall into runoff and infiltration and control the flow and chemical response of a catchment or its segments to the anthropogenic impact. Two principal components of runoff, surface and subsurface, which differ remarkably in their response time to precipitation or snow-melting events, are considered; however we do not present here a general mathematical framework for coupling the surface and subsurface flow equations, relying instead on an approach based on the transfer of boundary conditions (from one model domain to another). Soil infiltration theory, as discussed here briefly, plays the central role in such approach as well as in the solution of various problems of the surface and subsurface hydrodynamics. With this in view, special attention will be paid to some nonlinear and threshold phenomena in structured (discontinued by macropores and cracks) soils having a major impact on hydrological processes as well.